By creating a new experimental model to study quiescent — or "sleeping" — human cells, Drexel University researchers found that, when energetically stressed, the cells showed a signaling profile previously associated with inflammation. This suggests that the body is hardwired to respond to aging with the same "pro-survival" strategy it uses to fight off acute bacterial and viral infections by alerting the immune system. The study's results were published this month in Frontiers in Genetics. "Cellular 'instincts' to survive acute challenges are not well suited for long-term chronic stresses," said Andres Kriete, PhD, the study's principal investigator, associate director and teaching professor in Drexel's School of Biomedical Engineering, Science and Health Systems. The research team also saw a down-regulation of the protein p53 in the energy-starved cells. While low abundance of this protein prevents programmed cell death, it also impairs genome repair, which presents further evidence that aging cells essentially trade in their virility in order to survive, according to Kriete. "If cells are energetically stressed over longer periods of time, the genome maintenance could be impaired, which may explain why age is a risk factor for cancer," he added. The research team was interested in studying "sleeping" cells in relation to aging, since quiescence is the prevailing state of most cell types in the body, including fibroblasts, neurons and stem cells. In this phase, the cell is neither dividing, nor preparing to divide. Yet, surprisingly little is known about how quiescent cells respond to energetic and metabolic challenges. The current experimental approach, which is used to investigate the link between energy and aging, employs cells that are constantly proliferating. This model does not accurately mirror what happens in vivo. However, analyzing quiescent cells presents its own challenges, since responses to metabolic changes in these cells are often more subtle and difficult to detect. 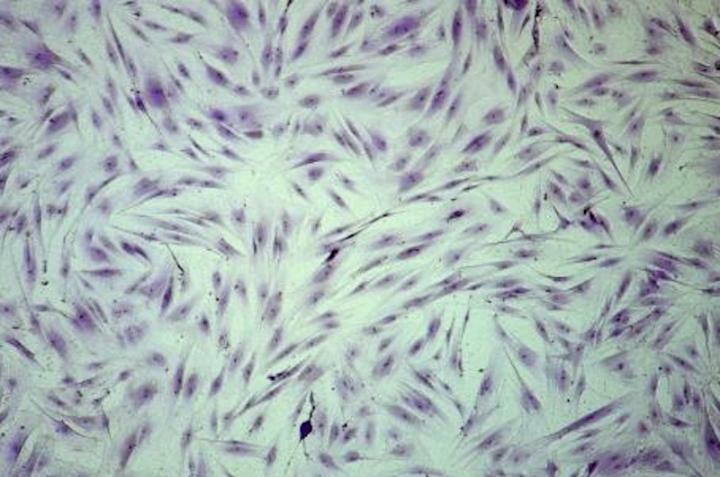 The research team was able to overcome this barrier and successfully established an "energy restriction" model in human primary dermal fibroblasts. The researchers restricted the cells' ATP (energy) supply by impairing both glucose uptake and mitochondrial function. These measures led to reduced energy levels — which reflects what happens in aging cells — without compromising the cells' viability during the 48-hour observation period. Kriete and his team were surprised to find that energy deprivation in quiescent cells was associated with reversible activation of the pathway NF-κB. Activation of this pathway has been linked to viral and bacterial infections, immune development and inflammatory diseases. So, it seems that aging cells respond to stress in the same way they may respond to an infection. "After optimization of our assay, we were able to tune the inflammatory profile to any desired level by choosing a specific degree of energy starvation," Kriete said. These findings not only shed light on inflammatory mechanisms in aging, but they also provide an important benchmark for further investigation of cell survival pathways and related molecular targets that are associated with growing old. Collaborators from Michigan State University and Thomas Jefferson University contributed to this research.